Hello Friends!! It’s been a while, almost two months in blog years! I took a small break and escaped without children and husband to Houston to visit my family and friends. I only went for five days but I am quite certain I put to use every single second of those five days. I had an absolute blast. I attended a dinner for the newest member of my family, a beautiful, baby boy born to my cousin and his wife. Almost everyone was there and it was so nice to see all my uncles, a couple of aunts and most of my cousins. Of course, my dad and brother were also there. I had a chance to visit with my best friends and it felt like I had never left. I am very fortunate to have such wonderful friends and family. Now, I am back to the grind; busy with the children and their school, volunteering at the mosque, and this week, with the preparations for the second Islamic holiday of Eid ul Adha. This Eid celebrates the pilgrimage to Mecca which many fortunate Muslims are completing today. Today is the Day of Arafah where all the pilgrims gather to ask forgiveness of their sins and acceptance of their Hajj (the pilgrimage.) It has been said that the Day of Arafah (called that because the pilgrims are on Mount Arafat on this day) is a reminder of the Day Of Judgement, where everyone will be asking for forgiveness from their Lord and hoping to enter Paradise. We pray that the Hajjis (pilgrims) have their Hajj accepted, their sins forgiven and their prayers answered. Eid ul Adha is tomorrow and on this day, all the pilgrims sacrifice a lamb or goat in memory of the sacrifice of Prophet Abraham (peace be upon him.) People like me, who didn’t go to Hajj, also sacrifice a lamb or goat so we can also be part of the Hajj celebration. I usually donate my lamb/goat on line to the needy because my husband is no expert at slaughtering animals! I will write later and tell you about my Eid festivities but let me tell you about this recipe. It’s a no brainer. It’s simple, super easy and almost everyone knows how to make it, so why am I posting it? First of all, it’s pretty dang good and there’s no need for you to pop open a jar when you can make this just as easily. Secondly, I am posting this for my cousin, Abrar. Abrar is my maternal uncle’s son. He is an incredibly intelligent, personable young man. He graduated from University of California at Berkeley in three years and was awarded a year abroad program at London School of Economics. He is currently in my home town living it up. When I found out he was going to London, I was so excited for him and had a list of must do and see things. I know he is enjoying it there, London is an amazing city and you can’t help but fall in love with it. Just so his brothers don’t feel left out, Ahmed and Amaan are also incredibly intelligent and suave young men in their own right. I admire them all very much. It seems fitting that Abrar has ended up in London since his dad used to visit us all the time. We had such a good time roaming the city with him and trying out all the restaurants. I remember being in my bed fast asleep and my uncle would creep in slowly and tell me to get up so we could go to Pizzaland for breakfast! I loved it when he visited and why not? I got pizza for breakfast! Abrar is very much like his dad in that he loves food, good food. I think he is making a dent in the restaurants there in London but I am quite sure that all this restaurant reviewing is also making a dent in his wallet. London is not cheap. I know he has taken up cooking and is starting to experiment and also, appreciate what it takes to put out a good dish. He posted on my Facebook wall that he was learning to make pasta and that I should expect a random question at any time. I thought I’d help him out by posting a recipe for him. I make this pasta all the time; it’s my children’s favourite. 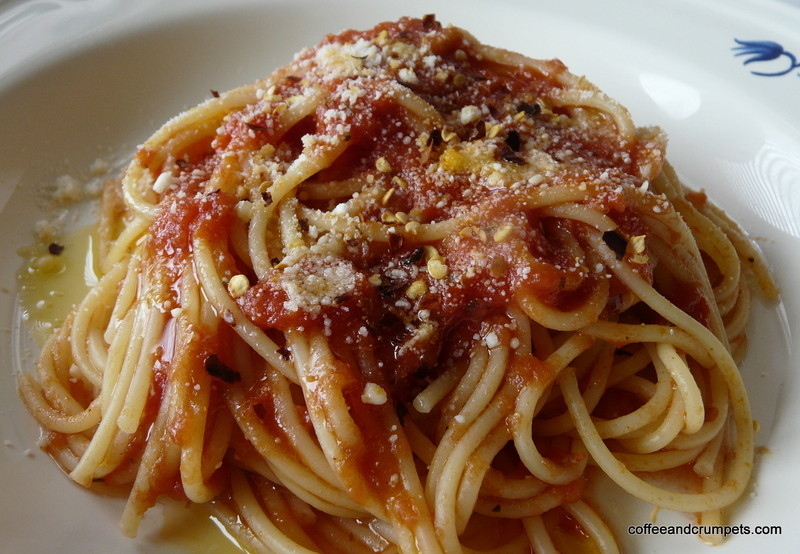 They don’t like the meat sauce spaghetti so I just make this very simple, but delicious version. (Abrar, if you want to add meat, brown some minced meat with an onion and garlic and mix into the sauce.) For a beginner sauce, this is a good one to try. I do like to make the more hearty marinara at times, like for my lasagne, but most times, I just use this one. Add a touch of crushed peppers, sprinkling of Parmigiana and a chiffonade of basil near the end and you have a perfect light pasta. Bring up a large pot of water to boil. Add the pasta and stir to prevent sticking. Add the garlic and stir, make sure you don’t burn it. Quickly add the tomatoes and stir, add the Italian seasoning. Simmer gently for 10 minutes till the sauce has thickened a little. Add straight to the sauce using a slotted spoon and heat through. 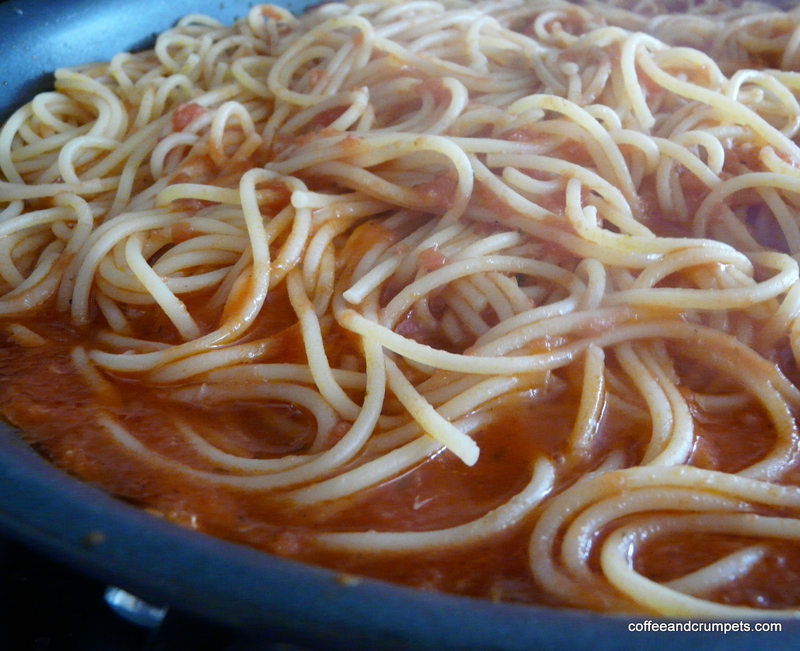 If the sauce is too thick, add some pasta water to loosen it up a bit. Add the basil and red crushed peppers if using. 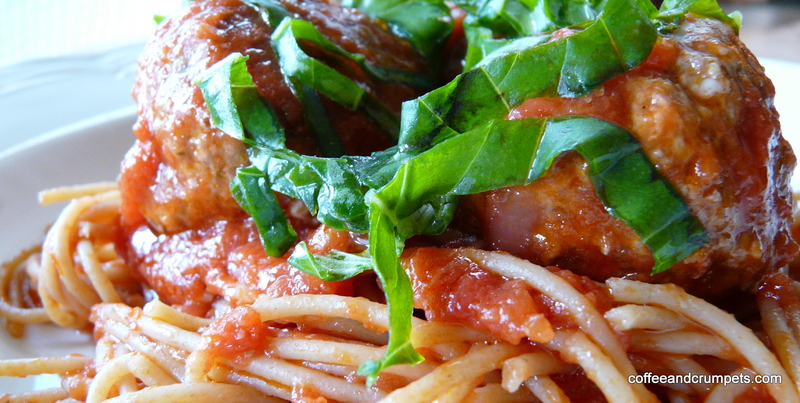 The picture above is of a more advanced dish, spaghetti and meatballs, my personal favourite. I hope Abrar gets some use out of my post and maybe y’all can find something in this too. I wish all my Muslim readers, my family and my friends a very happy Eid ul Adha. May God bless us, forgive us our sins, answer our prayers and grant us Paradise. Ameen. Lovely post :D. Delicious pasta! It is always a joy visiting you daaahling!You speak the gosphel, London isn’t cheap, but it is such a wonderful place, full of great food, art, and culture. I hope Abrar will enjoy is time there! London is a wonderful place! I enjoyed every second of growing up there. I miss it terribly. Who knows, maybe I’ll find myself back in my home town. Hope you get some use out of it, Abrar. Have a good time!! it was sooo good seeing you alhamdulillah! and this looks delicious mashallah. i hope you follow up this post with the meatball recipe you use 🙂 looking forward to it! You too Arshia!You were looking well. Sorry we din’t get to chat more but so many people! I will most definitely follow up with my meatball recipe very soon. Thanks for visiting! Glad to see you’re back and thanks for the explanation of another Islamic celebration. I like your little prayer at the end of the post. Your recipe for the simple tomato sauce sounds a lot like one I got out of a Lidia’s Italian-American cookbook. It is also very simple. You can add red pepper flakes to taste. 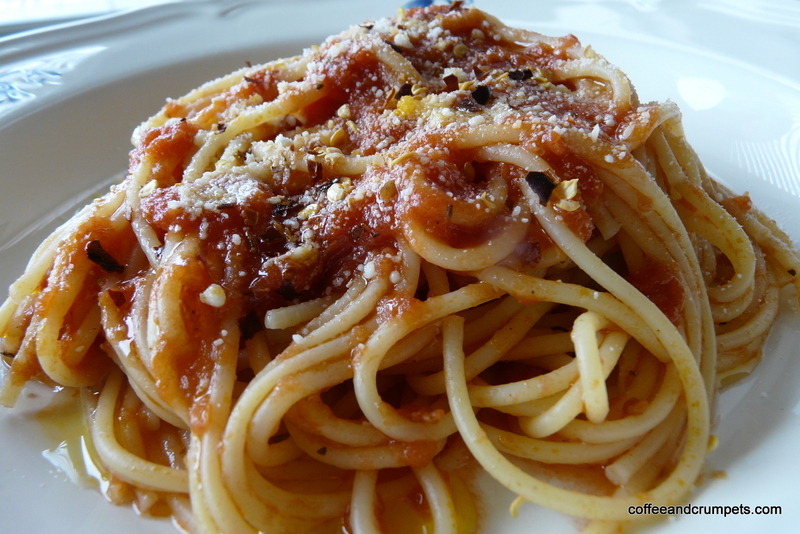 It’s called “Bucatini all’Amatriciana.” It calls for a little pancetta, though, so it’s not meat free. It is a pretty basic sauce! I don’t know of Lidia’s recipe but I am fond of her cooking. 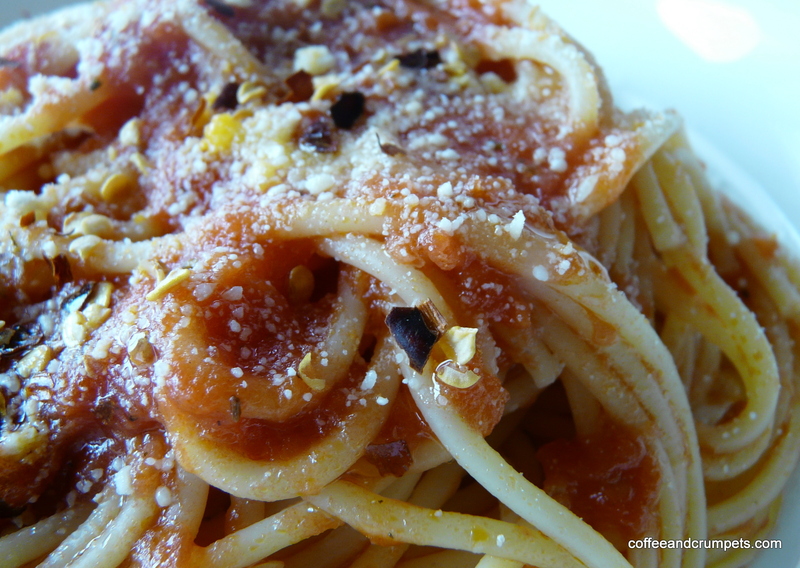 I made this sauce to recreate a pasta dish I had at an Italian friend’s house back in high school. This is very close to that and I always remember her when I take my first bite and am transported back to her kitchen table. Hope you are doing well Caterina. Looks like winter has made its arrival in the Rockies!